Darkest Hour, a film about Churchill, is certainly going to give me a lot of options, but I am going to stick to just two, as usual. Will you stop interrupting me while I am interrupting you! When I see a film about real-life events I always feel like I don’t need to be as careful about spoilers, but I still don’t want to take away the experience of seeing the film yourself. And see it, you should - but probably only for Oldman’s performance. 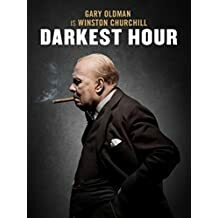 I thoroughly enjoyed it, and it seemed the theater was filled with others who were already fans of Churchill - many of them looked old enough to have followed his career in real time :) - but anyone who was not or who is not otherwise a real history nut, may have found themselves a little bored. The intent of the film was to cover a very short period in history - the darkest hour - during which people were called on to make decisions that would change the course of history for an entire world. It did that well if you ask me, but the film suffers a bit at several points. Firstly, many people can’t get out of their heads that this was a film about Churchill, which it really is not. I even wrote that myself above. No doubt that’s a testament to Oldman’s fantastic performance, as well as to the larger-than-life personality of Churchill himself, but when the film fails to tell the whole story of a character like that people can leave the theater unsatisfied. Secondly, the movie centers around an event in history that is already covered in great detail in another great film from the same year. The films tell quite different stories about that event, but I have heard people make the comparison. If this film is judged based on how well it tells the story from the other film, it will not hold up. Finally, as I’ve already hinted at, it bores a lot of people. I didn’t find it boring because I’m a sucker for this kind of history story - moments of destiny - but if you don’t share that affinity, you may find yourself bored. See it anyway - Oldman will almost certainly win the Oscar. His performance was spectacular.